Are you about to make the transition from freelance SEO consulting to in-house SEO? I’ve been there and back and am fully committed to consulting full time. In 2005 I searched for corporate SEO jobs at substantial companies, and found it very tedious to trawl through each of the major job boards, most of which simply scrape each other and repeat the same jobs. Other sources include SearchEngineLand or a few top SEO bloggers who sometimes mention full time positions in passing here or there. The major drawback to relying on jobs boards or even recruiters and headhunters is that each has a limited number of resources to draw from. For example, recruiters will only tell you about SEO positions they can get referral fees on, many organizations rely on posts by employers. While employers may use a single recruiter, rely on a single SEO jobs board or simply ask their human resources department to find a suitable SEO job candidate. Each of those have limitations and shortcomings that are dependent on incomplete knowledge and restricted sources. Lately it seems that LinkedIn jobs and even the venerable Ladders.com have horrible search results on saved searches. I’ve had those saved searches for years and each comes with regular emails listing out their latest. Over the past couple of years they seem to have dropped the requirement that my search term (SEO) is even included anywhere in the job description and my requirement is that it is in the job title. As I ruminated over how to simplify AND broaden that SEO Jobs search – it occurred to me that I might create a “Custom Search Engine”. Let me know what you think of the Reality SEO Job Search Engine! If you want to read valuable information to help you find that plum SEO job, read my definitive article which includes SEO salary ranges, expected degrees & SEO certifications, as well as typical SEO Job Descriptions in "SEO Job Search – Finding Search Engine Optimization Positions". 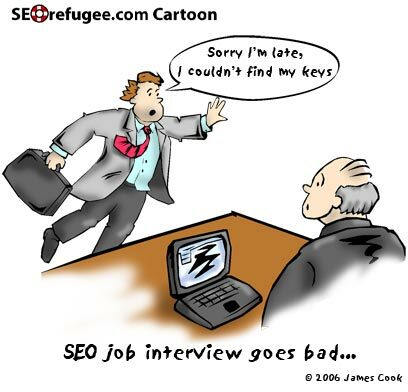 Once you’ve landed a few interviews, you’d be wise to read my Top Ten Tips for SEO Job Interviews article. If you’ve got comments on the results you get with this SEO Jobs custom search engine, visit this blog post and leave your comments. I was interviewed about a dozen times before accepting an SEO job myself and have participated in interviews of a couple dozen other SEO’s seeking work since then- and I hope you’ll find valuable both the SEO Job Search engine, and the tools and resources linked from this page. Let me know if the Google Custom Search Engine works for your job search. Meanwhile, here is a collection of SEO Employment Articles.